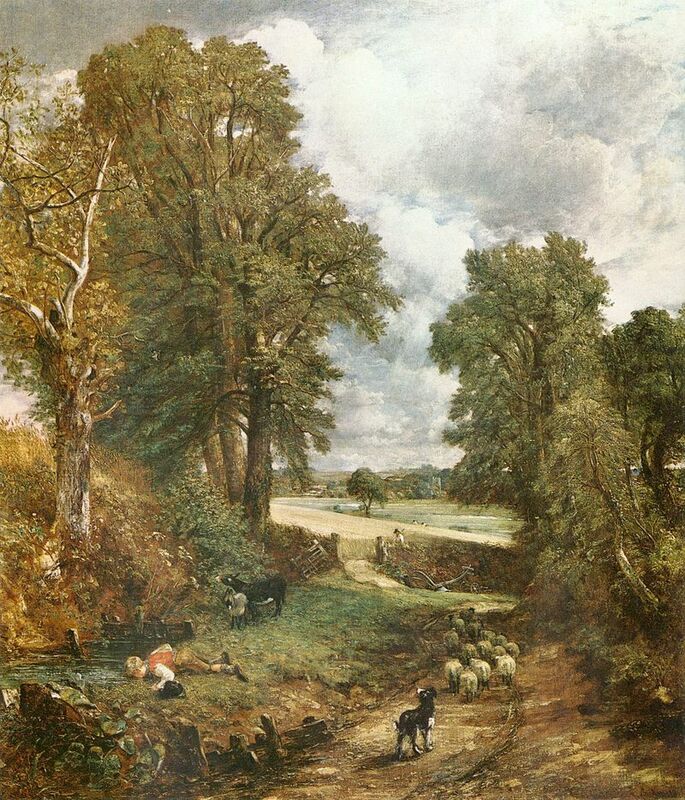 Today is the birthday (1776) of John Constable, RA, renowned English painter of the Romantic era known principally for his landscape paintings of Dedham Vale, the area surrounding his home — now known as “Constable Country.” Constable was never financially successful and he did not become a member of the establishment until he was elected to the Royal Academy at the age of 52. However, his work was embraced in France, where he sold more works than in his native England and inspired both Romantics and early Impressionists. 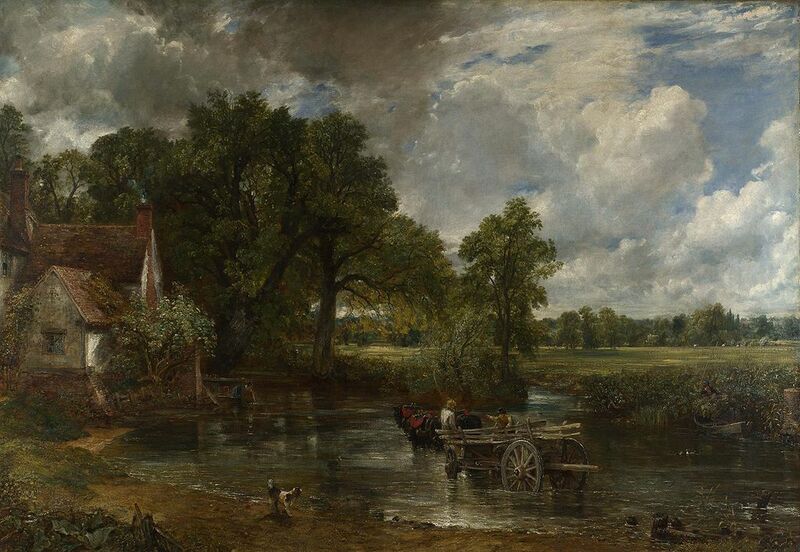 Constable was born in East Bergholt, a village on the River Stour in Suffolk, to Golding and Ann (Watts) Constable. His father was a wealthy corn merchant, owner of Flatford Mill in East Bergholt and, later, Dedham Mill in Essex. Golding also owned a small ship, The Telegraph, which he moored at Mistley on the Stour estuary, and used to transport corn to London. After a brief period at a boarding school in Lavenham, Constable was enrolled in a day school in Dedham. Constable worked in the corn business after leaving school, but his younger brother Abram eventually took over the running of the mills. In his youth, Constable went on sketching trips in the surrounding Suffolk and Essex countryside, which was to become the subject of major portion of his art. 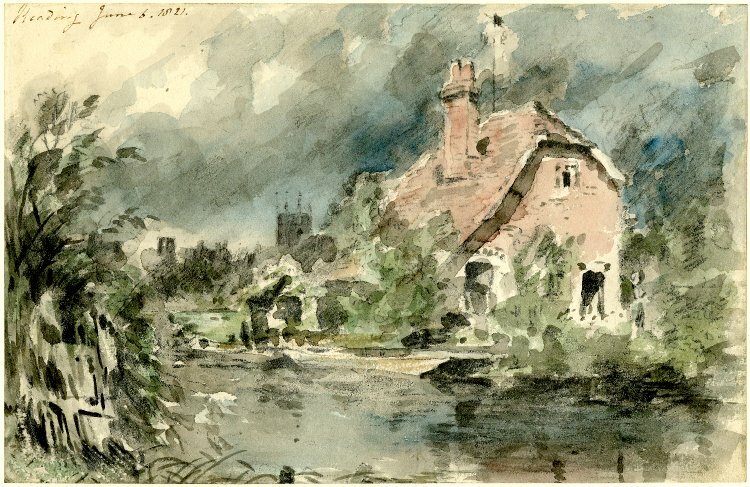 These scenes, in his own words, “made me a painter, and I am grateful”; “the sound of water escaping from mill dams etc., willows, old rotten planks, slimy posts, and brickwork, I love such things.” Later, while visiting relatives in Middlesex, he was introduced to the professional artist John Thomas Smith, who advised him on painting but also urged him to remain in his father’s business rather than take up art professionally. For the last two years I have been running after pictures, and seeking the truth at second hand… I have not endeavoured to represent nature with the same elevation of mind with which I set out, but have rather tried to make my performances look like the work of other men…There is room enough for a natural painter. The great vice of the present day is bravura, an attempt to do something beyond the truth. His nature was peculiarly social and could not feel satisfied with scenery, however grand in itself, that did not abound in human associations. He required villages, churches, farmhouses and cottages. Constable adopted a routine of spending winter in London and painting at East Bergholt in summer. 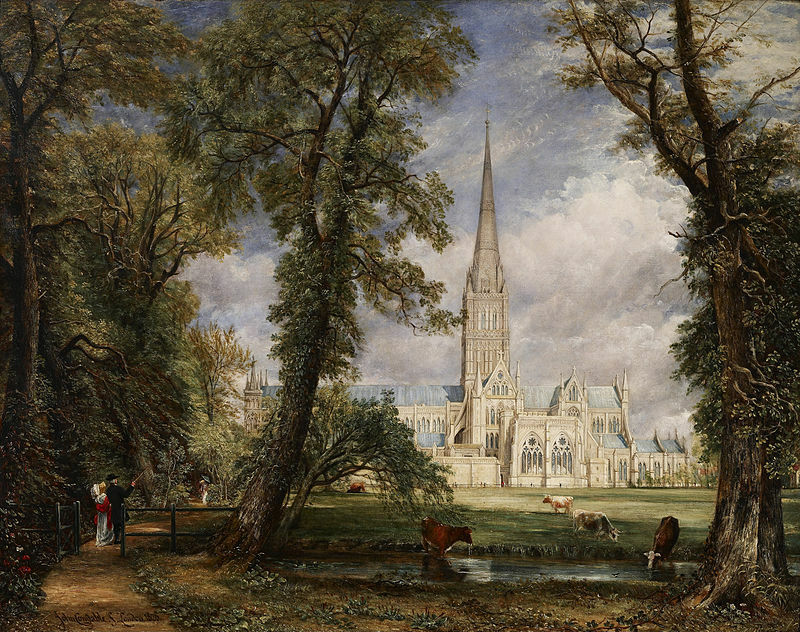 In 1811 he first visited John Fisher and his family in Salisbury, a city whose cathedral and surrounding landscape were to inspire some of his greatest paintings. 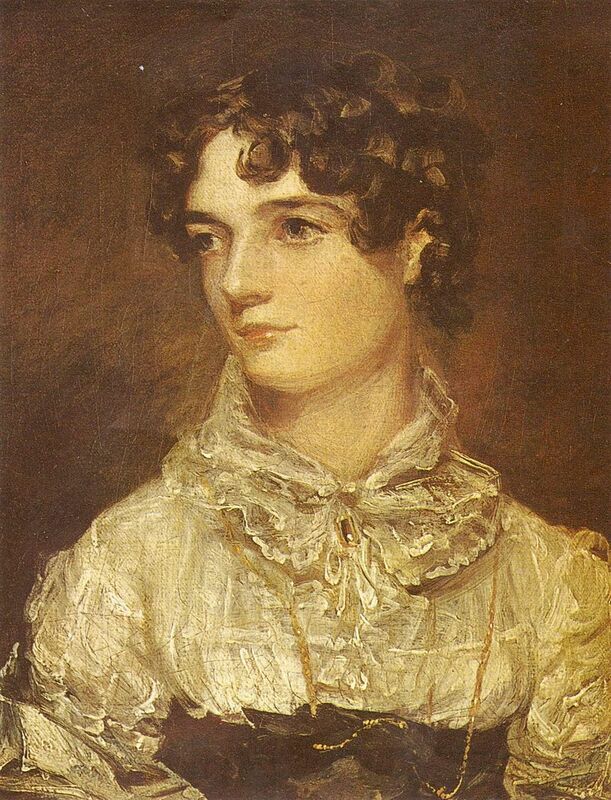 From 1809, his childhood friendship with Maria Elizabeth Bicknell developed into a deep, mutual love. Their marriage in 1816 when Constable was 40 was opposed by Maria’s grandfather, Dr Rhudde, rector of East Bergholt. He considered the Constables his social inferiors and threatened Maria with disinheritance. Maria’s father, Charles Bicknell, solicitor to King George IV and the Admiralty, was reluctant to see Maria throw away her inheritance. Maria pointed out to John that a penniless marriage would detract from any chances he had of making a career in painting. Golding and Ann Constable, while approving the match, held out no prospect of supporting the marriage until Constable was financially secure. 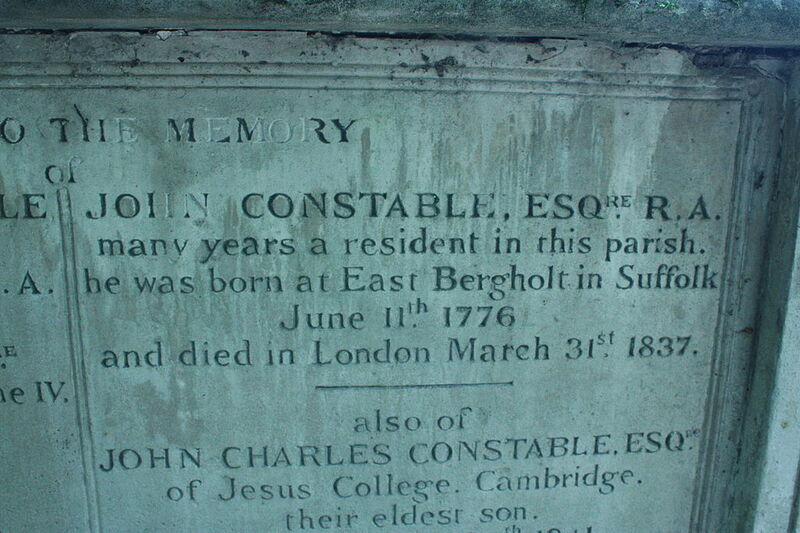 After they died in quick succession, Constable inherited a fifth share in the family business. John and Maria’s marriage in October 1816 at St Martin-in-the-Fields (with Fisher officiating) was followed by time at Fisher’s vicarage and a honeymoon tour of the south coast. 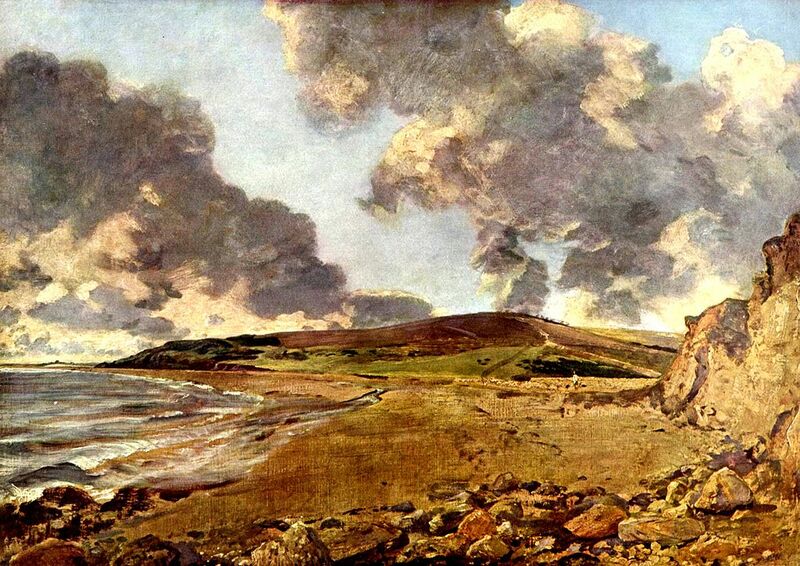 The sea at Weymouth and Brighton stimulated Constable to develop new techniques of brilliant color and strong brushwork. At the same time he put more overt and bold emotion into his art. Although he had scraped an income from painting, it was not until 1819 that Constable sold his first important canvas, The White Horse, which led to a series of “six footers”, as he called his large-scale paintings. That year he was elected an Associate of the Royal Academy. In 1821 he showed The Hay Wain (a view from Flatford Mill) at the Academy’s exhibition. 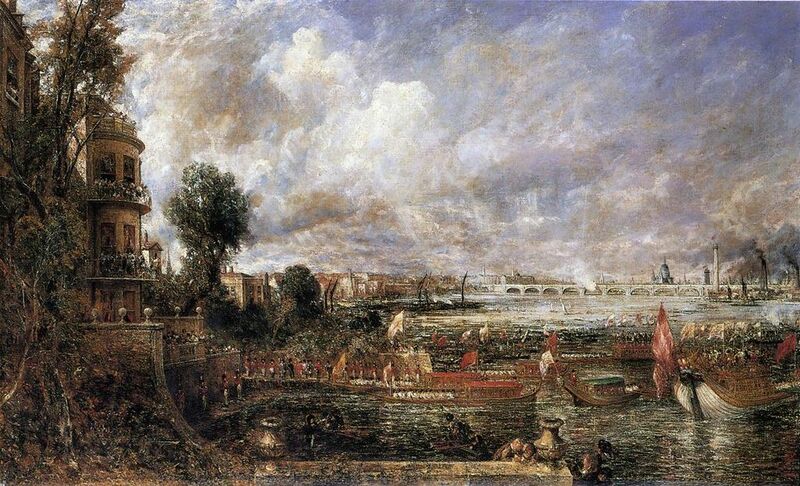 Théodore Géricault saw it on a visit to London and praised Constable in Paris, where a dealer, John Arrowsmith, bought four paintings, including The Hay Wain. It was exhibited at the Paris Salon of 1824, winning a gold medal. In his lifetime, Constable sold only 20 paintings in England, but in France he sold more than 20 in just a few years. Despite this, he refused all invitations to travel internationally to promote his work, writing to Francis Darby: “I would rather be a poor man [in England] than a rich man abroad.” In 1825, perhaps due partly to the worry of his wife’s ill-health, distaste of living in Brighton (“Piccadilly by the Seaside”), and the pressure of numerous outstanding commissions, he quarreled with Arrowsmith and lost his French outlet. After the birth of their seventh child in January 1828, Maria fell ill and died of tuberculosis on 23 November at the age of 41. Intensely saddened, Constable wrote to his brother Golding, “hourly do I feel the loss of my departed Angel—God only knows how my children will be brought up…the face of the World is totally changed to me.” Thereafter, he dressed in black and was, according to Leslie, “a prey to melancholy and anxious thoughts”. He cared for his seven children alone for the rest of his life. He was elected to the Royal Academy in February 1829, at the age of 52. 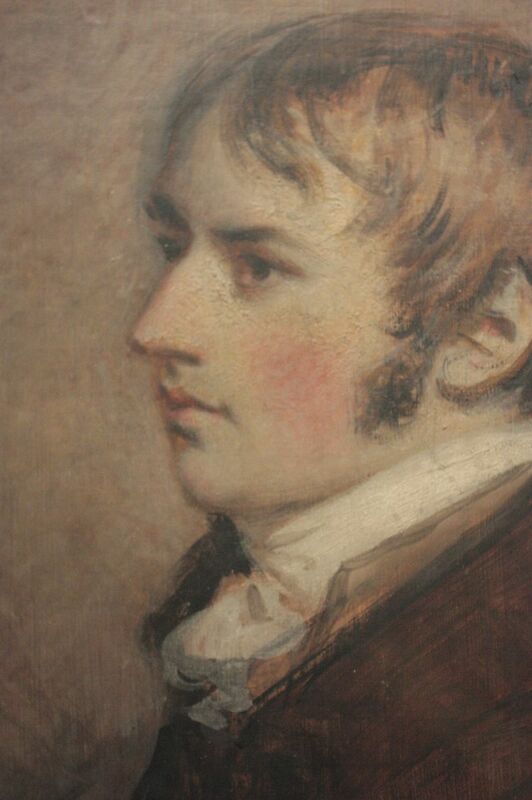 In 1831 he was appointed Visitor at the Royal Academy, where he seems to have been popular with the students. He began to deliver public lectures on the history of landscape painting, which were attended by distinguished audiences. 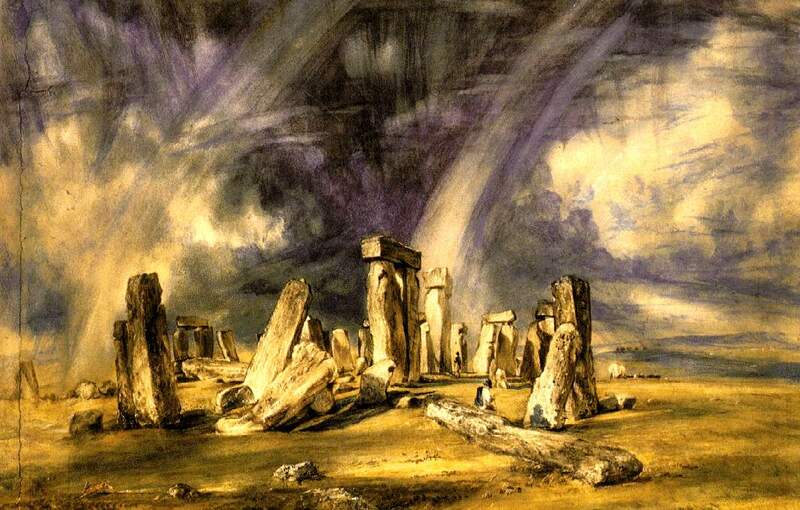 In a series of lectures at the Royal Institution, Constable proposed a three-fold thesis: firstly, landscape painting is scientific as well as poetic; secondly, the imagination cannot alone produce art to bear comparison with reality; and thirdly, no great painter was ever self-taught. He also spoke against the new Gothic Revival movement, which he considered mere “imitation”. In addition to the full-scale oil sketches, Constable completed numerous observational studies of landscapes and clouds, determined to become more scientific in his recording of atmospheric conditions. The power of his physical effects was sometimes apparent even in the full-scale paintings which he exhibited in London; The Chain Pier, 1827, for example, prompted a critic to write: “the atmosphere possesses a characteristic humidity about it, that almost imparts the wish for an umbrella”. Constable’s oil sketches were innovative in that he did them in oils directly from the subject in the open air. To convey the effects of light and movement, Constable used broken brushstrokes, often in small touches, which he scumbled (covered in a very thin layer of opaque paint) over lighter passages, creating an impression of sparkling light enveloping the entire landscape. 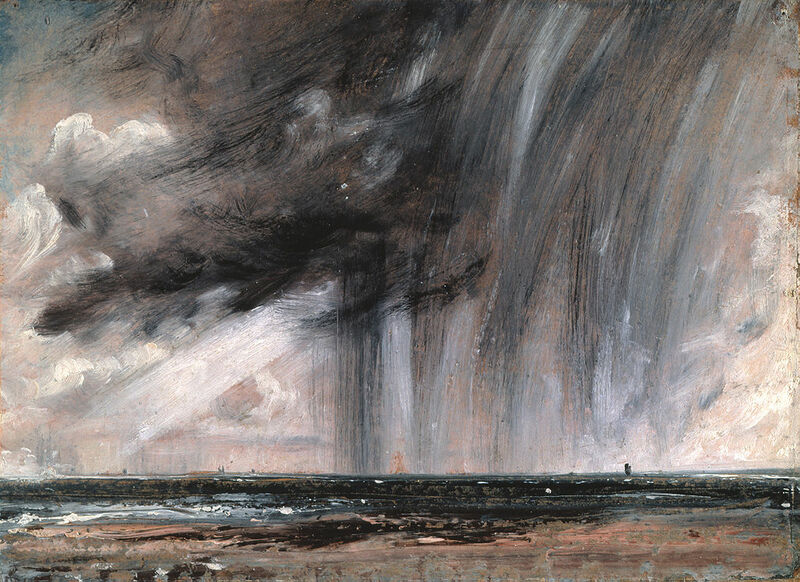 One of the most expressionistic and powerful of all his studies is Seascape Study with Rain Cloud, painted about 1824 at Brighton, which captures with slashing dark brushstrokes the immediacy of an exploding cumulus shower at sea. 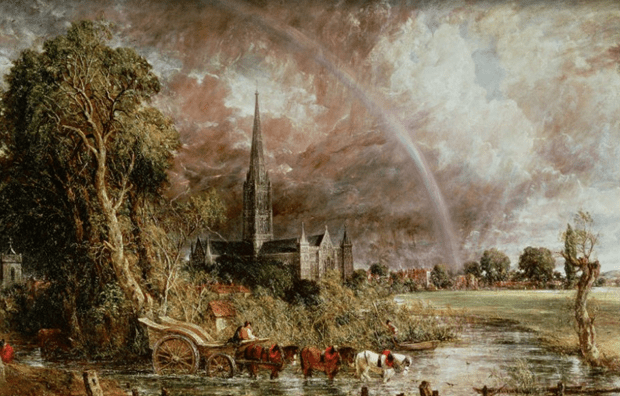 Constable also became interested in painting rainbow effects, for example in Salisbury Cathedral from the Meadows, 1831, and in Cottage at East Bergholt, 1833. East Anglian kitchels have been mentioned in English literature dating back to Chaucer. They can still be found easily in Suffolk or Essex. They are raisins, mixed peel, and almonds with spices sandwiched between layers of puff pastry. They are made by baking a single block and then cutting it into squares or rectangles so that the sides are open, not crimped. I generally use commercial frozen puff pastry for convenience, but if you are a dab hand, make your own. I tend to use a lot more spice than standard recipes. You choose how much you want, or select individual ingredients from my list at the bottom. Melt the butter over low heat in a large heavy-bottomed pan over medium-low heat and add the currants, peel, almonds and spice. Stir well with a wooden spoon so that everything is mixed thoroughly. Check seasonings. Remove from the heat and let cool. Grease a large baking sheet very well. Divide the pastry in 2 and roll out each half into equal rectangles. Place one half on the greased baking sheet and brush generously with melted butter. Spread the fruit/nut mixture evenly over the pastry base, ensuring there is a margin around all four edges. Give the edges an extra brush of butter and carefully place the second rectangle of pastry on top. Crimp the edges and brush the top with melted butter. Score squares or rectangles (as you prefer) in the top with a sharp knife. Bake for about 25 minutes, or until puffed and golden. Place the baking sheet on a wire rack, sprinkle with caster sugar if you wish, and allow to cool slightly. Cut away the crimped edges along the short sides , and use the score marks to cut the whole piece into squares (or rectangles). Serve warm or cold. I like a little whipped cream with them, but that’s probably a bit too indulgent, and is not traditional. You’ll see “mixed spice” as an ingredient listed in English recipes for desserts. It’s analogous to “pumpkin pie spice” in the US in that you can buy it prepared. I prefer to make my own, or, more commonly, add separate spices as I see fit. If you want precise measurements, here you are. Mix the spices together thoroughly and store in an air-tight container in the freezer.